Brakes surrendered their unbeaten start to the season at Edgar Street as they slipped to an unfortunate late defeat on their first visit to newly promoted Hereford, writes Paul Edwards. The Bulls have won three league titles in a row since the club formed from the ashes of Hereford United and despite being new boys in the National League North are one of the biggest clubs in it so there was no disgrace in defeat here. Brakes troop off at the final whistle after succumbing to a 2-1 defeat. 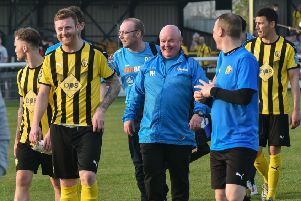 However, Leamington competed well throughout and were worth their half-time advantage only for injuries to key players to disrupt the team’s rhythm. The Brakes boss was without the suspended Callum Gittings, Joe Magunda stepping into the starting line-up, while Ahmed Obeng replaced Connor Taylor. But after being heavily involved in the opening 25 minutes Obeng was forced off with a hamstring problem to be replaced by the man he came in for. The hosts made a strong start In front of a crowd of 2,781, Eliot Richards threatening the Leamington goal with a skidding low drive from 25 yards that was watched all the way by Tony Breeden. Kieran Dunbar replied with a shot that was blocked behind for a corner and it was from a similar dead-ball situation that Brakes took the lead in the 19th minute. Dunbar delivered a cross into the six-yard box from the right that was missed by goalkeeper and defence but not Jack Edwards, who had the simple task of heading home his second goal of the season into an empty net. It was the first time Hereford had conceded in their opening four games and it rattled both the hosts and their supporters for a short time. Edwards almost slid the perfect pass through for Matty Stenson and Bulls keeper Martin Horsell needed to be off his line quickly to get there first. Hereford were using the wide open spaces of the Edgar Street pitch well, utilising both wings in search of an equaliser and James Mace was well placed to put in fine blocks on two efforts at goal as the hosts searched for an equaliser. They had a glorious chance to level things up just before half-time when Kieran Thomas’ ball in from the right was helped on by Harry White to Richards in front of goal, but when composure would surely have brought reward he sliced his shot high over the bar from close range. Ultimately Brakes’ downfall was their inability to hold on to their lead long enough to be able to settle back into the game after half-time. The half was only six minutes old when the home side were awarded a penalty after a shot struck the raised arm of Jamie Hood at close range. White stepped up and confidently thundered the ball into the net off the underside of the bar. Stenson had been well shackled by the Hereford defence despite almost breaking through on a couple of occasions and almost put Leamington back in front when he made space for himself on the edge of the box before curling in a powerful effort, the ball crashing back off the inside of the post and bouncing across the goalmouth with nobody in a blue shirt close enough to capitalise. The game began to get a bit niggly in the last 20 minutes as both sides fought for supremacy. Hereford substitute Jamie Bird almost made a spectacular entrance when he thrashed a stinging drive towards the top corner from just outside the box with practically his first touch, Breeden diving full length to keep it out. Joe Clarke’s free-kick saw Junior English’s header deflected into the arms of Horsell but there was to be late heartbreak as another dangerous effort from outside the box from Bird ricocheted off the inside of Hood’s leg and flew into the bottom corner, sparking scenes of delirium on the packed terrace behind the goal. Brakes gave themselves the opportunity to hit back with two late set-pieces but Mace headed wide and Hood blazed over at the far post, sending the ball sailing into the empty terrace behind the goal. Hereford: Martin Horsell, Kieran Thomas, Danny Greenslade, Billy Murphy, Harvey Smith, Jordan Cullinane-Liburd, Lance Smith (Jamie Bird, 80), Eliot Richards, Harry White, Mike McGrath, Lewis Hall (Keyon Reffell, 72).Subs not used: Calvin Dinsley, Ryan Green, Joslain Mayebi. Brakes: Tony Breeden, Junior English, James Bowen (Connor Gudger, 68), Joe Magunda, Jamie Hood, James Mace, Kieran Dunbar, Joe Clarke,Matt Stenson (Anthony Dwyer, 68), Jack Edwards, Ahmed Obeng (Connor Taylor, 27). Subs not used: Chekaine Steele, Kieran Morris.